European states have called emergency security meetings as suspicion mounts that Islamic militants were involved in the devastating bomb attacks in Madrid. Intelligence officials are to go to the Spanish capital to discuss improving co-operation, while EU ministers will hold talks on Friday. Security issues also look set to dominate a routine EU summit next week. The new meetings were announced as the US said it believed the al-Qaeda network was involved in the attacks. 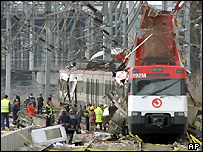 A US Homeland Security Department official, Asa Hutchinson, said there were many unanswered questions about the closeness of the Madrid bombers and the al-Qaeda network - but he was satisfied there was an al-Qaeda connection. Spain's general election, held just three days after the blasts that killed 200 people, resulted in a change of government and a threat by the incoming prime minister to pull his country's troops out of Iraq. "We have called a meeting for the coming days of the most important anti-terrorist services from the European Union," Spain's outgoing Interior Minister Angel Acebes told reporters. Top European police officials and others taking part would "co-ordinate inquiries and efforts, exchange information and plan for the future." Mr Acebes added that the Spanish government was working closely with EU and Moroccan intelligence services in its investigations of the Madrid attacks. In a related development, an emergency meeting of EU interior and justice ministers is planned in Brussels ahead of a European summit on 25-26 March. One idea put forward is for a special commissioner to be appointed to combat the terror threat in Europe. European Commission president Romano Prodi said: "We have to discuss thoroughly the entire [security] strategy and we will do it at the summit next week. "The anti-terrorism commissioner could be a piece of that strategy." BBC correspondents say the decision to hold the crisis talks reflects the view that the Madrid attacks have security implications well beyond Spanish borders. The bombings have prompted fierce debate in Germany about security measures, with the opposition calling for airport-style security to be introduced at railway stations across the country. Security is being tightened elsewhere in Europe, with undercover anti-terrorist police patrolling London's public transport system for the first time. Passengers using underground trains in London now face random checks and searches. 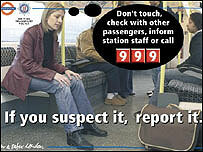 Posters have been put up in the city's transport terminals, urging the public to report anything suspicious. Spanish police are holding three Moroccans and two Indians in connection with the attacks.